Experience the beauty and tranquility of outdoor New Braunfels from the spacious covered patio of this gorgeous condo. 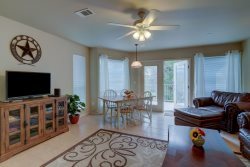 Professionally decorated and furnished you will be just steps away from the crystal blue waters of the Comal River. Walking distance to all of the downtown New Braunfels eateries and entertainment venues. The space was awesome for 7 adults! Loved the wine fridge, the large outdoor patio, the location was close to everything we wanted to do. We watched deer walk around the property while sitting on the wonderful patio too! Enjoyed the relaxing in the hot tub which was so close to the condo.